Is There Collusion Between Alan Grayson and MSNBC? What is going on with Alan Grayson and MSNBC? Our research reveals some surprising statistics. And there’s more to it than just numbers. We have to thank Media Matters for putting us on the scent. They have been publishing articles attacking Fox News for interviewing this candidate or that too many times for their liking. Last week they were concerned over the fact John Kasich has appeared on Fox nine times since announcing his candidacy (on June 1 2009). Similarly, MM complained that in the space of one year, Rand Paul made ’21 appearances’ on Fox. The number is a bit misleading, since when you subtract spots on Fox Business Network or online, it turns out to be 10 appearances on FNC. Still, it’s cited by MM to demonstrate that Fox ‘jumped to his cause’. While researching our response to the MSNBC challenge, we couldn’t help but notice a pattern. It seemed like one name kept recurring: Alan Grayson (D). Is it possible that MSNBC has been ‘promoting’ Grayson in the same manner that MM claims Fox was pushing Kasich and Paul? Alan Grayson organized his re-election committee on April 1 2009. He may not have started active fundraising at that point. But by October his campaign was up and running. He promoted his re-election website on Hardball (October 2 2009), Rachel Maddow (October 19), and again on Hardball (October 22). In each case he discussed his fundraising and gave out his website URL; in two of the three appearances he told viewers that he was doing a ‘money bomb’. Based on this it seems fair to start our count with October 2009 (even though that’s four months after Media Matters started counting Kasich appearances). Methodology: Media Matters uses Lexis transcripts and TV Eyes searches. We don’t have access to these premium services, so we had to make do with the interwebs. We searched the msnbc website for transcripts and, with the help of Google, searched the web for videos of Grayson appearances on MSNBC. Appearances on CNBC were not counted. It should be said that we only caught Grayson appearances where MSNBC provided a transcript (they do not for most programs) or someone uploaded a video. Since we don’t have access to a more complete database like that of TVEyes, there may have been even more Grayson hits on MSNBC than the ones we found. MSNBC’s dedication to Alan Grayson is striking. But it goes beyond mere numbers. Follow: In November of 2009, a political ad from ChangeCongress used footage of Keith Olbermann. MSNBC demanded the ad be taken down. A year earlier Tom Brokaw and audio of Olbermann were used in a Barack Obama ad. The Obama campaign was sent a cease and desist letter. 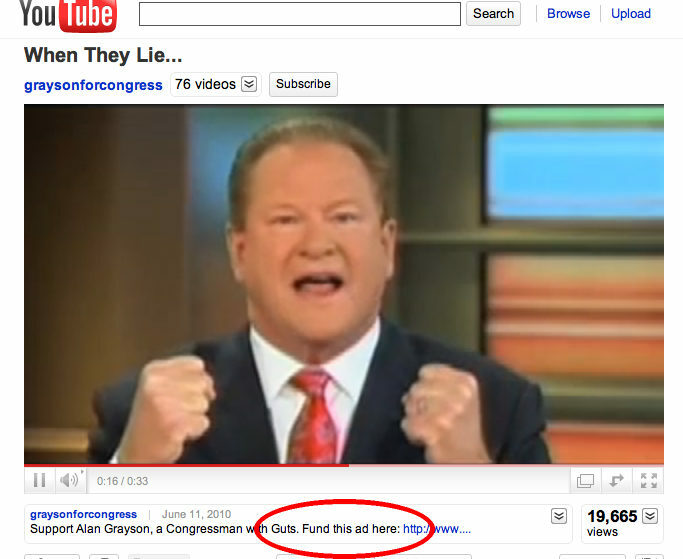 Not only does this ad incorporate MSNBC footage of Keith Olbermann and Ed Schultz, it’s also being used to do what? Raise money, of course. Four months after it was posted, it still sits on the front page (next to another fundraising pitch) of Grayson’s re-election site. The publicity MSNBC has given Alan Grayson is one thing. But is the news channel so invested in Grayson that they allow him to use the NBC News brand to get re-elected? Or is MSNBC unaware that this ad uses their footage and on-air personnel to promote a political candidate? The latter seems highly unlikely, given that MSNBC has played this ad--including the Olbermann/Schultz footage--on its air! What exactly is going on? Is MSNBC colluding with Grayson by letting him use their footage and brand identity to get re-elected? Will anyone ask them? Fox Nation: Is There Collusion Between Grayson and NBC News? Chris Golas: Is Democrat Alan Grayson MSNBC’s Candidate of Choice? Dates listed are broadcast dates. In a few cases the precise broadcast date of a video could not be determined; the upload date is given. Hosts/topics/visual data were used to place the interview within the relevant time frame.